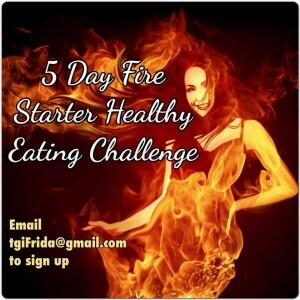 What is this 5-Day Fire Starter Challenge? There is no cost to join this challenge. However, you will be responsible for purchasing your own groceries. Dedicate 100% of yourself to this challenge and you’ll become focused and on point with your diet and shed some immediate pounds! I’ve had people tell me they’ve been able to sleep better, learned to love healthier foods and even lost inches off their waist! It’s amazing what difference 5 days can make! Send me an email at tgiFrida@gmail.com to sign up. “I definitely renewed my desire to cook more at home rather than leaving it mostly to my hubby, although he’s an awesome cook. Thanks Frida Gonzalez!